A work called the Kalevala, which the Finnish people consider their national epic, contains many of the legends. 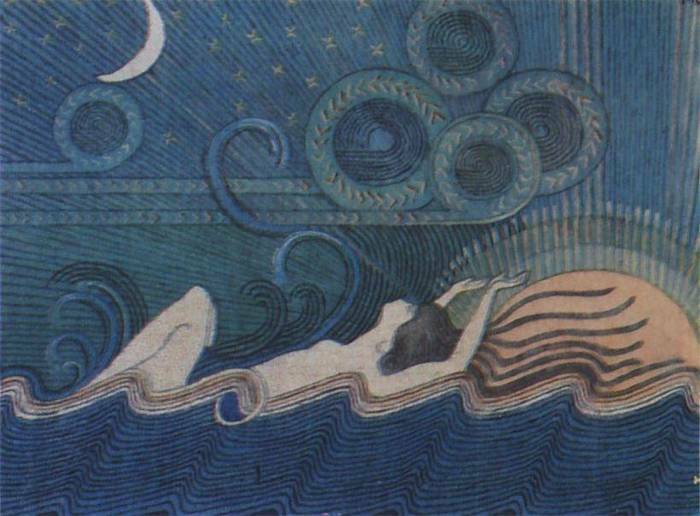 The Kalevala begins with the story of Ilmatar, who descends from the heavens to the sea, where she is tossed about for 700 years. During that time, a seabird lays eggs on her knee. When Ilmatar moves, the eggs break, and the pieces form the physical world and the sun and the moon. She then has a son, Vainamoinen, who begins life as a wise old man. Soon after Vainamoinen’s birth, the evil Joukahainen challenges him to a singing contest after hearing that the hero is noted for his magic songs. Vainamoinen accepts the challenge and wins the contest, causing Joukahainen to sink into a swamp. Fearing that he will drown, Joukahainen offers Vainamoinen his sister Aino in exchange for his rescue.